To celebrate John Venn's 180th Birthday, we're having a Month-long Mega-Month of Set-Loving Madness. 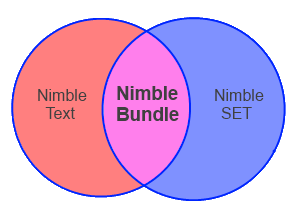 For the rest of August, NimbleSET and NimbleText will both be available as part of the special "Nimble Bundle". If you buy the bundle you'll save $10 over what you'd otherwise pay. That's a handy piece of cash to take home. Or to put it another way. When you buy NimbleText, for just $5 more, you get NimbleSET thrown in. 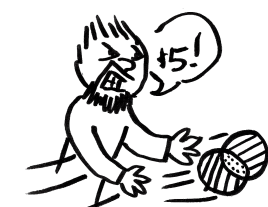 Here's a cartoon of Me, throwing NimbleSET in for $5. I'm not sure why I look so angry. Maybe because it's so cheap. I'm angry to be throwing away my work for such a steal, yes that's it. Now, just for fun, try saying "Nimble Bundle" five times quickly. "Nimble Bundle, Nimble Bundle, NimbleBundle, Nindle Bumble, Bumble Lindel." You're still here? Ah well, if you're going to keep reading you may as well stick around while we discuss the behavioural economics that underpins the things I've attempted above. First let's discredit the stated premise: this has nothing to do with John Venn's Birthday. Yes, NimbleSET is software for Venn-diagram-style comparisons of lists... but why would I know or care when the man's birthday is? I'm not even facebook-friends with the guy. No, the John Venn thing is cover for a different motive. I happened to see a google doodle about him and thought it would be a plausible 'angle' for the psycho-swindle I wanted to inflict on you, my good friends. If it's not about John Venn then what is it about? Well, money, of course, and my desire to separate you from yours, making it mine forever. But what's the specific psychology of the situation and why is it likely to increase the fatness of my wallet? When I first put out NimbleSET (back in January) I saw a sudden and permanent *decrease* in the sales of NimbleText. And it wasn't made up for by sales of NimbleSET, not nearly. I tried to ignore it, and tried to explain it away, but I was really at a loss to understand it. Until I read about the decoy effect and the idea of decoy products. "consumers have a specific change in preference between two options when also presented with a third option that is asymmetrically dominated." It wasn't exactly the decoy effect, but reading about that was enough to give me a hypotheses about what was happening. The purchase page went from listing 1 product for $20, to listing two products: 1 for $20 and 1 for $15. The cheaper product (NimbleSET) suddenly made NimbleText look expensive! So now I hope that by putting a third product in, that is clearly better value than either of the others, it will dominate the sales. So under this latest hypothesis, both NimbleText and NimbleSET are the decoys. The best deal is the bundle, and you'd be crazy to buy anything else. If I'm wrong, then, no problem at all, I take the Bundle off the market and head back to the psychology books for futher hints. I'll keep you informed, so please join me for the ride! And if you have other, better theories about what's going on, please tell me. It's all a mystery to me.